Celebrating its 30th anniversary this year, Bench staged a fashion and underwear show themed “Under the Stars” last Nov. 18 that created a lot of buzz in traditional and social media. Bench’s Under the Stars is the clothing brand’s ninth installment of the biennial fashion show that started in 2000. It skipped last year and returned this year to coincide with the brand’s 30th anniversary. 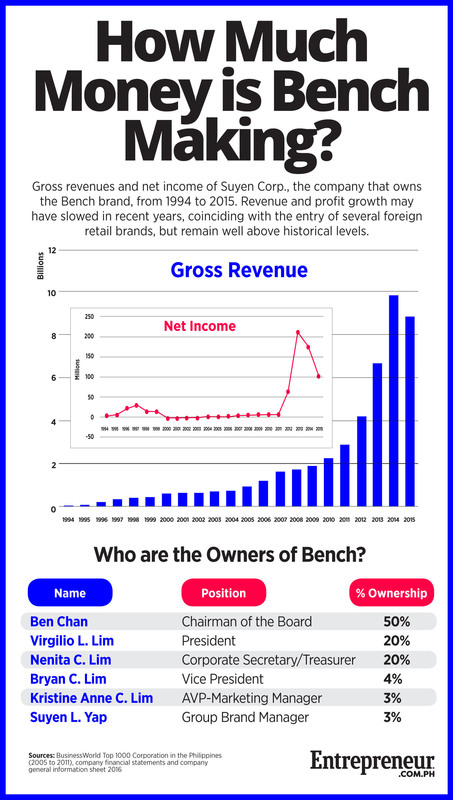 Perhaps unknown to its legions of fans, the company that owns the Bench brand, Suyen Corp., is also a financially successful company that grew by leaps and bounds since it was founded three decades ago. From the mid-1990s to 2015, revenue rose almost 200-fold to Php8.9 billion while net income increased 32 times to Php104.5 million. Interestingly, Suyen’s revenues and net income began growing rapidly after 2010, coinciding with the period when large foreign fashion retail brands entered the Philippine market. Japan’s Uniqlo first set up shop in 2012 while Sweden’s H&M arrived in 2015. Suyen’s revenue has consistently grown since the mid-1990s and fell for the first time only in 2015. After rising rapidly since 2011, net income also declined in 2014 and 2015. Ben Chan and Virgilio Lim, Bench’s founders, started Bench under the name Suyen Corporation, named after Lim’s daughter with Nenita Lim, Chan’s sister. According to its official website, it was through their smart utilization of billboards, celebrity endorsers and television commercials that Suyen steadily grew. It now has five other garment brands under its portfolio, including Her Bench, Human, Kashieca, Bench Body and Bench Accessories. There are now 141 Bench-branded store branches nationwide and five overseas—one in Myanmar and two each in Singapore and the US. In addition, Chan and Lim have international apparel and accessories brands in their portfolio, such as Cotton On and Vero Moda. They also have brands in the shoes and bags category, services, cosmetics, children and infants, home and furniture, and specialty food and restaurants. But some of these businesses are under other corporations. Helping the company hold its own amid the influx of popular international fashion brands are its well-loved if sometimes controversial advocacy campaigns. In 2015, Bench launched a campaign called “Love All Kinds of Love,” which aimed to promote gender equality. Though it garnered praise for its bold move in supporting the LGBT movement, it did not sit well with some of the more conservative Filipinos. It also launched another campaign in the same year called #LoveLocal, which promotes homegrown talent by using more Filipino models than international celebrities. Amid greater competition from international brands, it’s also a message that should help Bench retain and expand its following among Filipino consumers whose growing affluence gives them a wider array of local and international choices.